Winnemucca, Nevada – November 20, 2018 – Paramount Gold Nevada Corp. (NYSE American: PZG) (“Paramount” or “the Company”) announced today that it has mobilized drill rigs to its 100%-owned Grassy Mountain Gold Project (“Grassy”) in Eastern Oregon where the Company is in the process of permitting a proposed high grade underground gold mine. Approvals from the Bureau of Land Management (“BLM”) and the Oregon Department of Geology and Mineral Industries (“DOGAMI”) have been received for the first phase of the program which will consist of both exploration and geotechnical drilling within the area currently being permitted for the proposed mine. A second phase of the drill program will test targets outside the proposed mine project area. The first phase exploration program will include reverse circulation drill holes in the immediate vicinity of the Grassy Mountain deposit at the North spur target and shallow core holes 1,000 feet east of the deposit for geotechnical reasons and to test for possible extensions to the mineralization underneath post mineral basalts. In the first phase, reverse circulation drilling to a depth of approximately 700 feet will test the North Spur zone, a target located 500 feet north of the Grassy deposit. Historical shallow drilling at North Spur returned low grade gold values but did not penetrate the deeper silicified structures where the mineralization could have been concentrated. In addition to testing the hidden upper portion of the underlying Grassy formation, which is the host for the gold deposit at Grassy Mountain, a core rig will be used for geochemical and geotechnical testing to define material for back-fill and tailings dam construction. Paramount has also received approval from the BLM to drill beyond the Grassy permit area and will initiate the second phase of drilling upon completion of BLM bonding and DOGAMI approval. In the second phase, five reverse circulation holes are planned in two high priority target areas, including three holes at the Wally/Wood zone and two holes at the Dennis Folley target. Wally/Wood is located one mile north-northwest of the main Grassy deposit while the Dennis Folley target is located about two miles north of the deposit, as shown in the map below. “We are also planning to include our recently acquired Frost Project in our 2019 exploration program. 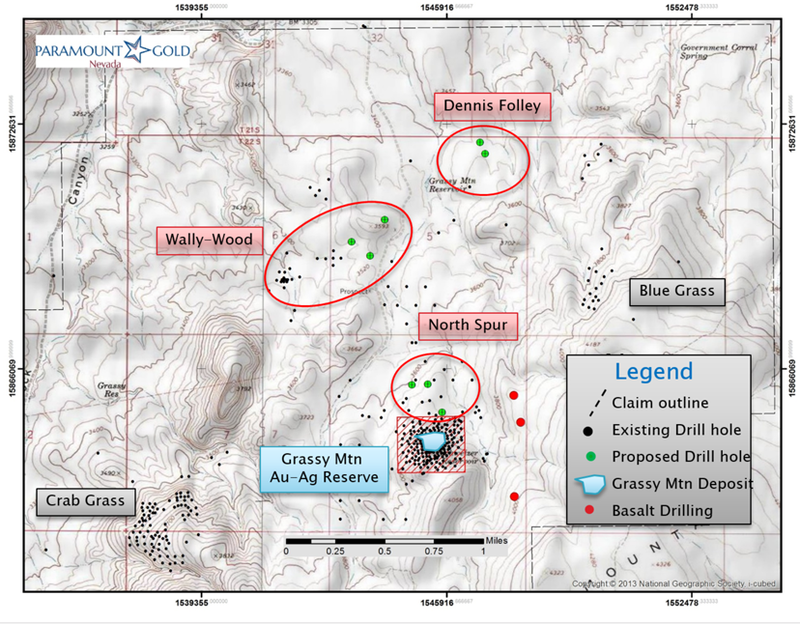 The Frost property is located just 12 miles west of Grassy and historical drilling has returned several high grade gold intercepts in a geological setting which is strikingly similar to the Grassy deposit. The helicopter mag and radiometric survey results from Frost are still pending and will be a great asset in prioritizing drill targets,” Van Treek added. See the Frost press release of November 14, 2018. The exploration program will be overseen by Michael F. McGinnis, Project Manager. Mr. McGinnis is a Qualified Person under National Instrument 43-101. He has reviewed and approved this press release. Paramount owns 100% of the Grassy Mountain Gold Project which consists of approximately 9,300 acres located on private and BLM land in Malheur County, Oregon. The Grassy Mountain Gold Project contains a gold-silver deposit (100% located on private land) for which results of a positive PFS have been released and key permitting milestones accomplished (see press release dated May 24, 2018). Additionally, Paramount owns a 100% interest in the Sleeper Gold Project located in Northern Nevada. The Sleeper Gold Project, which includes the former producing Sleeper mine, totals 2,322 unpatented mining claims (approximately 60 square miles or 15,500 hectares).